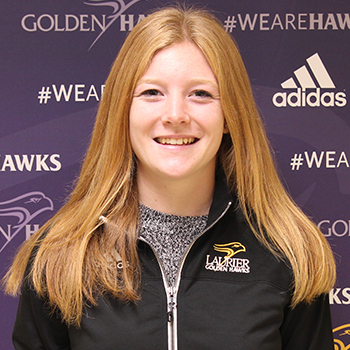 Kinesiology and Physical Education student Sydney Pattison was named the 2019 Outstanding Woman of Laurier on March 28, 2019. The cross country and middle distance runner was honoured for excelling in the classroom, in the community and on the field of play. Pattison, a native of Rockwood, Ont., was one of three nominees for this year’s award which included women’s soccer midfielder Jenna Lazarou of Toronto, and women’s hockey forward Danielle Wark (also a Kinesiology student) of Baltimore, Ont. Sydney has enjoyed a history-making season on the track for the middle distance program while also excelling in cross country, and is a strong student in the classroom. Sydney is the first cross country and middle distance runner to earn the award. In addition to all of that, she works hard in the local community, finding numerous ways to work with children and other fellow athletes.